The Scottish Rosslyn Chapel – either correct or incorrectly – is seen as the work of the local lord, William St Clair. 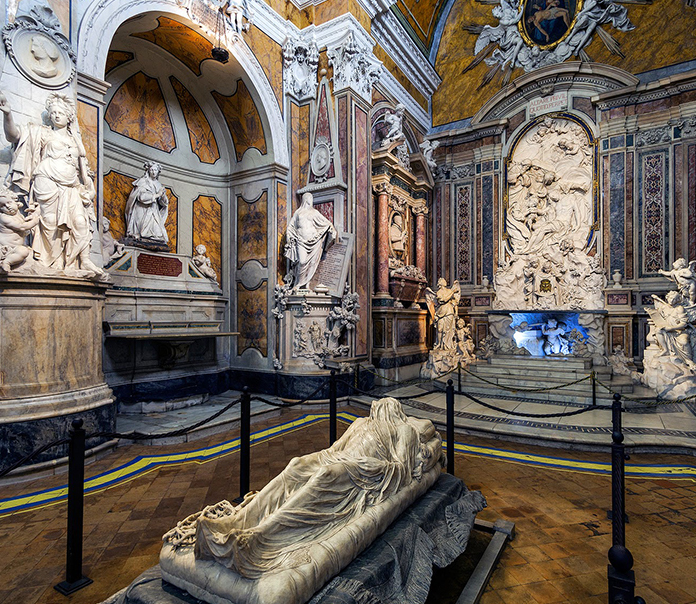 In the Italian city of Naples, a local church, the Cappella Sansevero, is seen as the work of the resident noble, Raimondo di Sangro. Both churches have been seen as a code that is left for future generations to be unravelled; both churches are icons of artistic excellence. But whereas Rosslyn’s code is supposedly installed to hide a secret of history (whether it is the Grail, Mary Magdalene, the Templars or something similar), Sansevero is apparently all about alchemy and Masonry. 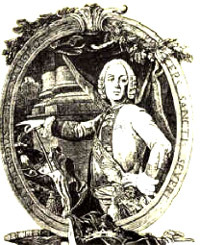 Raimondo di Sangro, the seventh Prince of Sansevero, was born in 1710. He studied at the Clementine College of Jesuits Priests in Rome, where amongst his teachers were Carlo Spinola and Domenico Quateironi, renowned in mathematics and hydrostatics respectively. He would not become as famous as them – instead, he would become illustrious. The Prince spoke many European languages, as well as Arabic and Hebrew. He moved in the highest social circles and corresponded with the greatest scientific scholars of his town. He was very much like Leonardo da Vinci: an inventor, interested in the human body, and apparently also interested in alchemy, though it is not always clear whether he practiced advanced science (chemistry) or alchemy – if there is a difference. Like Leonardo, he had a passion for war machines. During his military command, he made a cannon out of lightweight materials that had a longer range than the standard cannons of the time. But his intellect went further: he did not merely invent, he was also a military strategist; he penned down a treatise on the employment of infantry, for which he was even praised by Frederick II of Prussia. Whereas Leonardo was claimed to be a member of various organisations (though no proof exists for his allegiance to any), it is known that di Sangro was a leading member of Freemasonry. He was, in fact, the head of the Neapolitan Masonic lodge, until he was excommunicated by the Church. Pope Benedict XIV soon revoked it. For some commentators, it was because the Pope “realised” that the accusations of heresy against him were the product of slander and envy from the Prince’s detractors. For others, it was purely the outcome of political pressure applied on the pontiff. Di Sangro is linked with Cagliostro, one of the most famous Masons, who met Cavalier Luigi D’Aquino (1739-1783), who according to the tradition was his initiator as well. Cagliostro met him in Malta in 1766 and stayed with him in Naples in 1773, to receive the instructions which enabled him to found the Egyptian Freemasonry, in Paris, in the same year his master passed away. But in 1790, in front of a Roman tribunal of the Holy Inquisition, Cagliostro claimed that all his knowledge of alchemy was taught to him many years before in Naples by “a prince who had a great passion for chemistry”. The judges did not believe him and didn’t give any weight to his words. Still, if true, this prince must have been none other than di Sangro! Any details of the trial remain unavailable, for all transcripts from the trial were declared secret and to this day remain locked inside the Vatican. Cagliostro would go on to write things such as: “After having taken this grain the one who is going to rejuvenate becomes unconscious for three hours and in convulsions he sweats and evacuates continuously. After having come to himself and changed bed he must be fed with a pound of fat free beef and cooling herbs. If this food makes him feel better on the following day he is given the second grain of Original Matter in a cup of broth that besides the effect of the first grain will cause him a very strong delirious fever .He will lose the skin, and the teeth and hair will fall out. On the following thirty-fifth day if the patient recovers his strength, he will soak in a bath for one hour in neither cold nor hot water. On the thirty-sixth day he will have his third and last grain of Original Matter in a glass of vintage and generous wine that will make him sleep quietly and peacefully. Then the hair grows back, the teeth too and the skin gets healed. When he wakes up he soaks in new aromatic bath and on the thirty-eighth day he will have a bath in plain water mixed with niter. 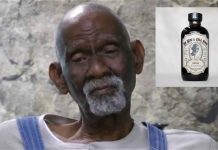 Later on he gets dressed and starts walking in his room, then on the thirty-ninth day, he takes ten drops of Balsam of the Great Master along with two spoons of red wine. On the fortieth day he will leave the house, rejuvenated and perfectly recharged”. Cagliostro’s writing is a mixture of alchemy and modern medicine, which in essence it was. But it is included here for it reflects many of di Sangro’s own experiments with chemical compounds, some of which are known to have made him seriously ill. His aides repeatedly asked him to stop experimenting in his cellar, as he was bound to die from experimenting too much himself. This was the cellar of his palace, on the San Domenico Maggiore Square. Looking down, on the sides of the front door at number 9, you can still see the bars of the cellar windows which once served as the Prince’s laboratory. 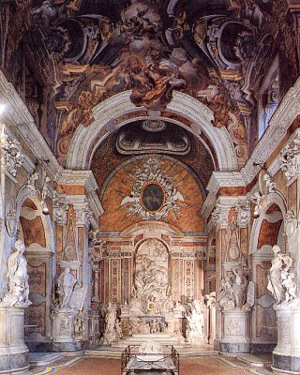 Di Sangro decided that the family’s chapel, around the corner in the Via de Sanctis, would be his personal legacy. The chapel sits, as mentioned, just off San Domenico Maggiore, the Dominican church where men like Giordano Bruno had lived. “Sansevero” is much smaller, but in artistic value it is able to rival its neighbour. William St Clair invited foreign artists to work on Rosslyn Chapel; Di Sangro commissioned the greatest artists of the time, including the Venetian Corradini, as well as Queirolo and Sammartino, to sculpt statues for his church. Like William St Clair, Raimondo did not just limit himself to commissioning the works; he also personally selected the marble, suggested techniques and subjects for each work and decided the location of the masterpieces. When he died in 1771, the church indeed grew into his legacy and is now seen as the centre of Neapolitan Baroque; it is indeed believed to contain a cryptic, Masonic message that many have tried to unravel. When we look at the chapel today, there is little to suggest that the church has a uniform symbolic message to impart to the visitor. Certain features have symbolic connotations – which the guidebooks explain. Some features have a “double entendre” that suggest di Sangro could indeed be an initiate of some intriguing esoteric tradition, but these clues are sporadic and do not move throughout the chapel in a consistent manner – and are sometimes contradictory. That is not the only problem: the hypodermic syringe that would have been necessary to make the “injection” was officially only invented one hundred years later by a surgeon from Lyon, Carlo Gabriele Pravaz (1791-1853). 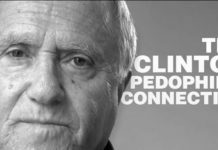 Hence, others have stated that di Sangro “merely” took a skeleton and covered it with an artificial network of blood vessels. 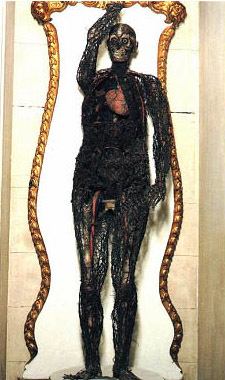 Some believe he used wax to create the arteries. But: tests performed on the “machines” in the 1950s revealed that “the whole system of blood vessels, upon analysis, showed that it was metalicized, that is they were soaked in and kept their shape by the metals settling in it”. It is also known that di Sangro was able to compose a material similar to the substance – deemed to be blood – in the ampoule of San Gennaro, a precious relic that Naples continues to worship each January and which is said to miraculously liquefy during the ceremony; in fact, di Sangro did not want to underline too much that what he had invented was identical to the relic’s substance, but “like” it. Still, how the Prince accomplished this and the two “anatomical machines” remains a mystery. No wonder that when people saw these skeletons, di Sangro became the subject of gossip and wild rumours. Some people claimed that he was a sorcerer, a diabolical alchemist who ordered people to be kidnapped, so that he could perform heinous experiments on their bodies. 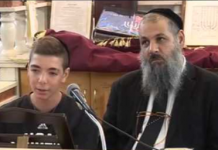 Others argued that he was a godless predator of young boys who he later castrated. There were even those who said that he ordered the killing of seven cardinals and then made the same number of chairs out of their bones and skin. There is however truth in the story of the castrated boys. One of his hobbies was “bel canto” – singing. Di Sangro had married Carlotta Caetani of Aragon, a relative on his mother’s side, and had five children (Vincenzo, Paolo, Gianfrancesco, Carlotta and Rosalia), but he still enjoyed going around his many estates looking for young boys with beautiful voices. Usually he would find them in the church choir, from which he would “buy” them from their parents, however not, as some may think, for sexual pleasures; indeed, it seems quite the opposite: Giuseppe Salerno castrated them, after which they would be locked up in the Conservatory of Jesus Christ’s Poor in Naples, where they started their careers as “sopranists”. But back to his chapel. Masons have identified the chapel as the expression of a Masonic ideal, namely the progression towards salvation or enlightenment. Di Sangro illustrated this path with the graves, which proceed, virtue by virtue, to this culmination. These virtues include: decorum, liberality, religion, softness of marriage, sincerity, self control, education, and divine love. They stress that he emphasized the last two sepulchres, modesty and disillusionment. The final sculpture, at the end of the path, is the Veiled Christ – which originally should have been in the “cave” below. 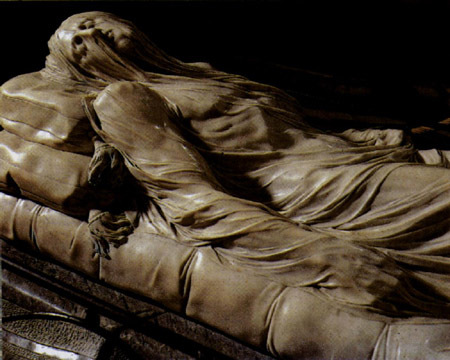 The Veiled Christ is one of the most renowned pieces of art in the world. 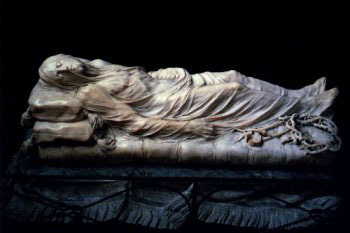 It was sculpted in 1753 and shows a veil covering the body of the Christ. Many have observed that in its presence, one feels one is observing the true body of Christ. Canova, the great sculptor of the 19th century, defined it as “an awesome work, second only, perhaps, to Michelangelo’s Pieta”. He added that he would give ten years of his life to have been its creator. The most remarkable aspect of the piece is the veil; some believe that a veil literally “petrified”, perhaps through a chemical process such as occurs naturally at Mother Shipton’s Cave in Knaresborough (England). 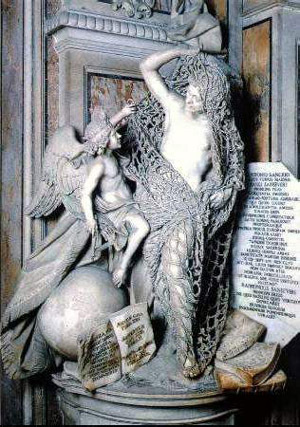 Like the statue of Disillusionment, by the Genoese sculptor Francesco Queirolo, the net completely surrounds a statue that has already been sculpted, while nevertheless being an integral part of it. How can that be done – sculpting underneath the tiny holes of the net, yet without breaking the net and still being able to sculpt the body to its finest detail? In both cases, the question is how these sculptors were able to cover their works with veils and nets made of marble, for it is clear that there is no other method of achieving the final product? To find two such examples in one chapel suggests that it was di Sangro’s chemical mastery that may have contributed to the solution. How? Some claim that the veils were obtained by crystallizing a base solution of calcium hydrate or slaked lime. Supposedly, the statue was placed in a tub and covered with a wet veil (or net), over which a diluted calcium solution was poured, before the liquid was sprayed with carbon oxide coming from a coal burning oven. The end result is calcium carbonate, i.e. marble, which would then be joined to the rest of the statue. But no-one has yet practically demonstrated this theory to be do-able, or the one the Prince used. There may be another small “anomaly” in this Veiled Christ, as there is a slight indentation over the nostril, as if the shroud is being sucked in by breath – is this “dead Jesus” alive? Did di Sangro believe that Jesus had not died on the Cross? If so, perhaps he was not only a Mason, but a member of another, even more mysterious, order? The article first appeared on Philip Coppens website.